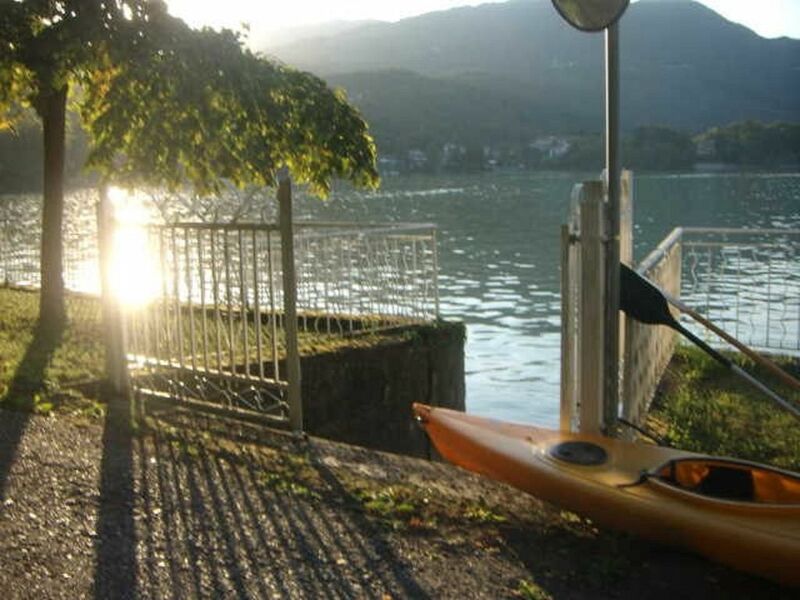 Where the hills meet the lake, directly on Lake Avigliana, the apartment with equipped garden has an independent entrance and is located on the ground floor of a beautiful villa. Directly overlooking the lake. Unique position, priceless view, your holiday in complete relaxation on the shores of the great lake of Avigliana. The apartment consists of a room with TV, fully equipped kitchen with relaxing sofa or to watch TV, bathroom with shower embellished with private garden directly overlooking the lake, from where you can enjoy a splendid view. Possibility of adding a cot / crib for baby. The house is inserted in a park with private dock. Nearby are available for guests, equipped and free beaches, where it is possible to practice water sports, canoeing, windsurfing, pedal boats and swimming. If you love cycling, we will provide it whenever possible. In a strategic position, at the entrance of the Val di Susa, suggestive trails start along the lake, ideal for lovers of mountain biking or horseback riding. Nearby there are excellent restaurants pizzerias and trattorias and entertainment venues. Guests are free to move according to their needs, we are always available for any need. The unique position is the characteristic that distinguishes the apartment. Directly on the shores of the lake. Nice, quiet and comfortable apartment. Close to all services and premises for recreation. Five minutes from the beaches of the lake to practice water sports, such as swimming pedalo 'sailing and so on. The Val di Susa is certainly one of the most beautiful valleys of Piedmont. Here we find Avigliana. Inserted in the characteristic Natural Park that offers a great variety of faunal and floral to be discovered and admired. The purpose of the establishment of this park was not only to preserve the territory and the animal and plant specimens found there, but also to integrate nature and the daily life of the local population. This is why numerous paths have been set up, learning facilities such as the fishing ecomuseum, maps and routes, thus offering residents and travelers a unique experience. The park is located in a characteristic area of ​​the morainic amphitheater, dating back to the last two great prehistoric glaciations. Located just 25 kilometers from Turin, the Avigliana Lakes Natural Park is an excellent destination for a trip out of the chaos of city life. The Lakes of Avigliana are very old. In fact, they formed during the last two great prehistoric glaciations (one occurred 230,000 and the other 120,000 years ago). These two lakes are at the center of the Natural Park, which, in addition to offering a wide variety of fauna (bird in particular, for bird watching enthusiasts) offer a splendid panorama made of magnificent colors that change at different times of day. If you are looking for a place in the surroundings of Turin where you can spend a few days immersed in nature, this natural park will surely amaze you. And to complete your journey in this area of ​​the lower Susa Valley, we recommend a visit to the town of Avigliana. There are many things to see such as the splendid medieval castle, the Clock Tower and the Gothic style church of San Pietro. In short, it is worth a jump here! In the immediate vicinity about 9 km. we find the Sacra di San Michele. Reachable along various paths or more comfortably by car in less than 10 minutes. (10 KM ABOUT). This building is certainly one of the main attractions of the Val di Susa. Located near Mount Pirchiriano, it is one of the largest religious complexes in Piedmont whose ancient history (the date of construction dates back to before the year one thousand) is intertwined with the legends of white magic, being, for experts of white magic , right here one of the most powerful magical points in Europe. Another fulcrum of considerable interest, reachable by the ring road with only 25 minutes, is the Royal Palace of Venaria, designed by architect Amedeo di Castellamonte by the will of Duke Carlo Emanuele II who wanted to make it his hunting lodge and built in a very short time, from 1658 to 1679, the Reggia di Venaria is certainly one of the largest and most beautiful Savoy residences. Imposing, sumptuous, his project was resumed for the construction of the palace par excellence, that of Versailles. The Reggia di Venaria has been a UNESCO World Heritage Site since 1997. In addition to the beautiful interiors, where often important exhibitions are hosted, the marvelous gardens are the pride of this magnificent building with the spaces of the English Gardens, the Flowers and Roses, and the area of ​​the woods. .
Turin city center, just 25 km away, can be reached by ring road, bus or train. It is a city of a thousand faces. Ancient capital of Savoy, birthplace of the Risorgimento, capital of industry, city of art and culture, innovation pole. With its immense heritage inherited from centuries of history, and the dynamism of a city open to the world, the Piedmontese capital allows you to see a perfect combination of architectural and monumental jewels, museums (over 40), art galleries, entertainment, good food, events of international fame, such as the Book Fair, the Taste and the Torino Film Festival. A constant calendar of things to do and see at any time of the year. The Mole Antonelliana, the Egyptian Museum, the royal residences, the Holy Shroud, the gianduiotti, are just some of the city's treasures on the banks of the Po, an unmissable destination for those who want to know the splendor of its splendid past by discovering its masterpieces. Place suitable for lovers of nature, water sports, fishing, climbing, cycling and walking and horseback riding. nearby only 10 km. places of interest such as the Sacra di San Michele Avigliana city of the two lakes, with its medieval center awaits you !!!! Avigliana liegt im Piemont und ist vom großem und dem kleinen See geprägt. Von Weitem sieht man die Alpen, welche keine 100km entfernt liegen. Man könnte meinen man befinde sich in der Schweiz - es ist aber das Piemont. Die Fotos sind wahrheitsgetreu. Casa Giulia befindet sich unmittelbar am See - das Eisentor, welches sich mittels Drücker öffnen lässt, sichert die private Sphäre ab. Sehr ruhig gelegen und dennoch fehlt die «Italianità » nicht. Avigliana ist mir sehr untypisch einer italienischen Atmosphäre herüber gekommen - nicht aber das Nachbardorf Giaveno! Da muss man hin. Es gibt andere Sehenswürdigkeiten.. aber diese zu erläutern überlasse ich Google. 25 km davon liegt Turin. Aufgrund ihrer Infrastruktur (alles gerade Straßen - quadratisch gebaut) habe ich die Stadt-Hektik so gut wie nicht gespürt. Viele Läden und autofreie Zonen - herrlich. Was Turin alles an Kulturelles zu bieten hat, überlasse ich ebenfalls Google. Fazit: Will man abends in die Stadt und am nächsten Morgen von einer angenehmen Ruhe geweckt werden, dann ist Casa Giulia genau das Richtige. Die Inhaber sind hervorragende Menschen. Sehr bemüht, dass es ihren Gästen gut geht und sind jederzeit hilfsbereit. Ich wurde regelrecht verwöhnt. Die Wohnung ist sehr sauber, stil- und liebevoll eingerichtet und ist mit allem was man zum Wohnen braucht ausgestattet (Inkl. Putzmittel und Tücher). Ich werde wieder kommen. PS: in der Regel sind Haustiere nicht erlaubt aber wie es so schön heisst: es gibt keine Regel ohne Ausnahme. In der Planung versucht Giulia alle ihre Gäste zufrieden zu stellen und falls es die Möglichkeit erlaubt, sind Haustiere herzlich willkommen - einfach nachfragen. Come back whenever you want!!!! My home is always open for you. è stato un piacere incontrarti. La mia casa è sempre aperta per te. Close to the area are some Italian Restaurants, just 5min to walk. Thanks, come back when you want you will always be welcome. Io e la mia famiglia abbiamo soggiornato due settimane ad Avigliana e ci siamo trovati benissimo. Cercavamo un posto tranquillo dove trascorrere le vacanze con nostro figlio di un anno ed abbiamo trovato questo appartamento in riva al lago con un ampio giardino. La casa non è grandissima, ma c'è tutto l'occorrente. All'esterno sul retro c'è anche un piccolo spazio privato con tavolo e sedie. La signora Giulia e suo marito sono stati gentilissimi e ci hanno aiutato moltissimo con il bambino piccolo fornendoci un seggiolone e le biciclette. A pochi minuti dalla casa si trovano una spiaggia privata e alcuni ristoranti/pizzerie e con 15 minuti di camminata è possibile arrivare alla spiaggia libera. Assolutamente consigliato per una tranquilla vacanza sul lago. Grazie, è stato un piacere ospitarvi e conoscervi. Siete stati ottimi ospiti. Speriamo di rivedervi, tornate quando volete. vous êtes des invités idéaux, ce fut un plaisir de vous rencontrer. AVIGLIANA where the hills meet the lakes, a place full of history with its medieval village, the natural park, a place full of beautiful charm with rich architectural and medieval heritage. The swimming lake is attractive for those who love water sports in the surrounding area fascinating trails to be traveled by bike, on foot or on horseback. Strategic location at the foot of the Val Susa, to reach destinations such as Turin, Venaria Reale and its Royal Palace, the castle of Stupinigi, 25 minutes. Another popular destination just 10 km away is the Sacred Abbey of San Michele, the symbol of Piedmont.